John Provart, for the Applicant. Max Berger, for the Respondent. 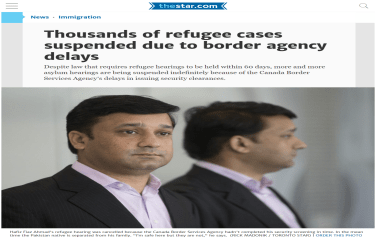 HENEGHAN J.:– The Minister of Citizenship and Immigration (the “Applicant” or the “Minister”) seeks judicial review of a decision of the Immigration and Refugee Board, Refugee Protection Division (the “Board”). In that decision dated February 11, 2010, the Board dismissed the Applicant’s application to reconsider and vacate a finding that was made by the predecessor of the Board that Mr. Ajitpal Singh Gondara (the “Respondent”) is a Convention refugee. That decision had been made on February 7, 1996. The Respondent is a citizen of India. He is a Sikh from the Punjab. His full name is “Ajitpal Singh Gondara” but he has been known as “Ajitpal Singh”, “Ajitpal Singh, son of Jagbir Singh” and “Ajitpal Goldy Singh”, “Goldy” being his nickname. In India, the Respondent was a basketball player at the national level. He was also a community organizer. The Respondent had moved to Uttar Pradesh in 1989 and in 1992, returned to the Punjab. On November 8, 1993, the police raided his home, arresting the Respondent and his cousin. The police brought the Respondent and his cousin to a police station in Faridkot, where they were separated. The police accused the Respondent of being a militant. He was tortured over two days. He was released upon payment of a bribe. His leg and nose were broken, ending his career as a basketball player. The Respondent returned to Uttar Pradesh. He was arrested again on November 14, 1994 and tortured again. He was sent to Punjab and tortured. He was released upon payment of a bribe. He continued to suffer harassment from the police. The Respondent decided to leave India. He travelled to Delhi on or about December 10, 1994 and left the country on December 14, 1994. He travelled to the United States of America via Germany, arriving on December 16, 1994. He was detained for illegal entry and then sought asylum in the United States but was advised to travel to Canada instead. He arrived in Montreal, Quebec on February 3, 1995. After the Respondent’s departure from India, the police began harassing his mother and youngest brother about his location. Eventually the police began harassing his other younger brother. The two brothers left India in 1997 to seek asylum in the United States and in 2002 to seek asylum in the United Kingdom, respectively. Sometime after his detention in Faridkot, a statement was filed with the Punjab police accusing the Respondent of a robbery that was committed in July 1992. The Respondent was not named in the original police report of that incident. Another report was filed at a different Punjab police station in February 1996 alleging that the Respondent had participated in an armed robbery in January 1993. Again, the Respondent had not been named in the original police report. Since he was out of the country, the Respondent was declared a “Proclaimed Offender” in July 1996. In February 1995, the Respondent applied for refugee status in Canada. He indicated that he had left India on February 5, 1995. He did not disclose one of his brothers in his original Personal Information Form (“PIF”) and the PIF was later amended to include the brother. The Respondent’s refugee claim was fast-tracked and no hearing was held before the Board. He was granted refugee status on February 7, 1996. Among the documents that the Respondent submitted to the Board, in support of his identity, were a birth certificate in the name of Ajitpal Singh, a driver’s licence issued to (GONDARA) Ajit Pal Singh, school documents issued by Punjab University and the Punjab Education Board Ajitpal Singh and certificates from various state basketball associations issued to Ajitpal Singh or Ajit Pal Singh in support of his identity. In 2001, the Respondent asked his uncle in India to obtain a passport for him. The Respondent wanted to drive a truck to and from the United States and found the annual renewal of his refugee travel documentation to be cumbersome. The uncle obtained a passport for the Respondent. Because it is illegal to mail a passport from India, it was given to a family friend who was travelling to the United States. The friend mailed the Indian passport concealed in a dictionary, to the Respondent. The package was intercepted and seized in April 2003 by the Canada Border Services Agency (“CBSA”). At his hearing before the Board, the Respondent said that the passport had never been in his possession and further, that he would not have used it. In September 2002, the Applicant had applied for Canadian citizenship. His citizenship ceremony, scheduled for July 11, 2005, was cancelled on that day. The Respondent sought an order of mandamus before this Court relative to his citizenship application. On February 15, 2006, Justice Barnes allowed the application and ordered that the Respondent be granted citizenship within 150 days. That did not happen and the Respondent sought further relief from the Court. The Respondent was ultimately granted citizenship on July 18, 2006. In October 2007, the Respondent initiated proceedings for the annulment of the outstanding charges in India. By December 2008, he was exonerated of both charges and the designation of “Proclaimed Offender” was lifted. Meanwhile, on May 21, 2008 the Minister had brought an application before the Board to vacate the decision granting refugee status to the Respondent. Initially, the Applicant alleged that the Respondent’s refugee status should be revoked on the basis of criminality and misrepresentation of identity documents. The Respondent’s birth certificate and driver’s licence had been found questionable by the CBSA. A Memo from the Interpol Wing of the Central Bureau of Investigation, New Delhi, addressed to the Royal Canadian Mounted Police, dated March 17, 2006, states that the Punjab police department in Faridkot determined that the Respondent’s birth certificate and driver’s licence were counterfeit. Following the cancellation of the criminal charges in India, the Applicant limited the vacation request to the issue of identity. In a decision dated January 20, 2010, the Board denied the Minister’s application. It found that, despite the misrepresentations, the original RPD panel had sufficient remaining evidence to find that the Respondent had established his identity. This evidence consisted of the documents relating to the Respondent’s education and sports activities. What are the applicable standards of review? Did the Board err in its assessment of the birth certificate and driver’s licence? Did the Board err in its interpretation of section 109 of the Immigration and Refugee Protection Act, S.C. 2001 c. 27 (the “Act”) relative to its mandate? Did the Board ignore relevant evidence? Did the Board err in failing to consider that the education and sports documents were tainted by the Respondent’s misrepresentations and lack of credibility with respect to identity? Was the Board’s decision reasonable with respect to subsection 109(2)? As a preliminary matter, I note that following the hearing of this application for judicial review, the Respondent filed a motion in writing pursuant to the Federal Courts Rules, SOR/98-106, seeking leave to introduce new evidence concerning certain documents that he had submitted in the course of his expedited refugee determination and the documents considered by the Board in the vacation application. By Endorsement and Order issued on January 27, 2011, that motion was dismissed. The present application will be decided on the basis of the documentary evidence that is included in the certified tribunal record, that is the evidence that was before the decision-maker, that is the Board, who dealt with the Minister’s application. Turning now to the first issue, that is the standard of review, this must be considered in relation to each of the arguments advanced. In Dunsmuir v. New Brunswick,  1 S.C.R.190, and Canada (Citizenship and Immigration) v. Khosa,  1 S.C.R. 339, the Supreme Court of Canada said that there are only two standards of review by which decisions of statutory decision-makers can be reviewed, that is reasonableness and correctness. Where the appropriate standard of review has already been determined, an exhaustive review is not required in subsequent cases. For findings of fact and issues of mixed fact and law, the standard of reasonableness applies. That standard applies to both the decision-making process and the outcome of the decision. Errors of procedural fairness are reviewed on the standard of correctness. Errors of law are generally reviewed on a correctness standard, unless the decision-maker is interpreting a statute within its area of expertise, as was emphasized by the Supreme Court of Canada in Smith v. Alliance Pipeline Ltd., 2011 SCC 7. The issues relating to assessment of the documentary evidence and the ultimate outcome of the application to vacate Convention refugee status pursuant to subsection 109(2) are to be decided on the standard of reasonableness. The assessment of evidence is a fact-driven exercise, that is issue number 2 and number 4, while issue number 6 raises a question of mixed fact and law. Issues number 3 and 5 raise questions of statutory interpretation. In light of the discussion in Dunsmuir and the recent decision in Smith respecting the applicable standards of review, these issues are reviewable on the standard of reasonableness. I will now address the issue of the Board’s assessment of the birth certificate and driver’s licence, an issue raised by the Respondent. The Board had found these documents to be fraudulent and the Applicant submits that this finding is reasonable, the Respondent argues that it is not. According to the Respondent, the Board acted capriciously in relying upon an analysis of the Faridkot police department’s analysis of these documents. The CBSA’s analysis of the documents showed only that the documents were of doubtful authenticity. The Board noted that the Faridkot police department was not the wisest choice for verification but that it had exonerated the Respondent of criminal charges and was reliable. It considered this evidence together with the CBSA analysis, as well as the fact that the Respondent had been forwarded a fraudulent passport from India and a report discussing the availability of fraudulent documents in India. Considering the cumulative weight of this evidence, the Board found that on a balance of probabilities, the documents constituted misrepresentations. In my opinion, the Board’s analysis of these documents was justified, transparent and intelligible, in accordance with the criteria discussed in Dunsmuir, and therefore, reasonable. The Board committed no reviewable error in respect of these documents. (1) The Refugee Protection Division may, on application by the Minister, vacate a decision to allow a claim for refugee protection, if it finds that the decision was obtained as a result of directly or indirectly misrepresenting or withholding material facts relating to a relevant matter. The Refugee Protection Division may reject the application if it is satisfied that other sufficient evidence was considered at the time of the first determination to justify refugee protection. If the application is allowed, the claim of the person is deemed to be rejected and the decision that led to the conferral of refugee protection is nullified. (1) La Section de la protection des réfugiés peut, sur demande du ministre, annuler la décision ayant accueilli la demande d’asile résultant, directement ou indirectement, de présentations erronées sur un fait important quant à un objet pertinent, ou de réticence sur ce fait. Elle peut rejeter la demande si elle estime qu’il reste suffisamment d’éléments de preuve, parmi ceux pris en compte lors de la décision initiale, pour justifier l’asile. La décision portant annulation est assimilée au rejet de la demande d’asile, la décision initiale étant dès lors nulle. The Applicant argues that this provision of the Act allows the Board to conduct a two-stage inquiry but does not require a two-stage inquiry. He submits that after finding a misrepresentation, the Board was not required to conduct an analysis pursuant to subsection 109(2). The Respondent disagrees with the Applicant’s interpretation of section 109 and takes the position that the provision requires the Board to undertake an analysis pursuant to subsection 109(2), but gives the Board discretion in conducting its analysis. Further, the Respondent submits that the Board properly undertook an inquiry and analysis of the evidence, pursuant to subsection 109(2). The Board, when considering an application brought under s. 69.2(2) [the predecessor to subs. 109(1)] of the Act, may examine whether there is sufficient evidence remaining on which a determination of Convention refugee status may be found, after removing the fraudulent information or the misrepresentation. In other words, the Board has the jurisdiction to consider whether, notwithstanding the fact that Convention refugee status was obtained by fraudulent means or misrepresentation, suppression or concealment of any material fact, the person could still have been found to be a Convention refugee at the time of the original determination. The Board may not allow an application made under s. 69.2(2) of the Act without first turning its mind to s. 69.3(5) [the predecessor subs. 109(2)] and determining whether it ought, in the circumstances, to exercise the discretion conferred by that provision. In proceeding to make an inquiry under subsection 109(2) as to the existence of other credible evidence that could support key parts of the Respondent’s claim, in particular his identity, the Board acted in accordance with the discretion granted by the Act and in accordance with the manner that section 109 is meant to be interpreted. The Board did not err in its interpretation of subsection 109(2). It is clear that the Board interpreted this subsection as requiring it to consider whether, after setting aside the tainted evidence, namely the Respondent’s birth certificate and driver’s licence, there was remaining credible evidence upon which a Convention refugee claim could succeed. The next issue is whether the Board ignored relevant evidence. The Applicant submits that it did, in particular a document entitled “India: The availability and prevalence of fraudulent identity documents in India“. Although the Board referred to this document in relation to the Respondent’s altered passport, it was not mentioned in connection with the education and sports certificates. Essentially, in my opinion, the Applicant is complaining, in the guise of an argument, that the Board ignored evidence that impairs the Respondent’s credibility relative to the remaining identity documents. The Applicant raised the issue of ignoring evidence as an error of law. Although the Applicant characterized this issue of ignoring evidence as an error of law that could be reviewable on the standard of correctness, I disagree. In my opinion, the real issue is whether the Board erred in its assessment of the facts before it. That issue is reviewable on the standard of reasonableness. I am not persuaded that the Board ignored relevant evidence. Its reasons make it clear that it considered all relevant evidence including the document about fraudulent documents in India and the fraudulent passport. The Board properly excluded evidence about the Respondent’s presence in a geographic area of Canada that is associated with smuggling activities since that evidence was not relevant to the credibility of the education and sports documents. In the result, I am not persuaded that the Board erred as alleged by the Applicant. The next issue is the Board’s alleged error in failing to consider whether the education and sports documents were tainted by the Respondent’s misrepresentation and lack of credibility relative to his identity. The Respondent, relying on the decision of the Federal Court of Appeal in Coomaraswamy v. Canada (Minister of Citizenship and Immigration),  4 F.C. 501 (F.C.A. ), submits that the Board is barred from reassessing evidence that the Minister did not show was tainted by misrepresentations in a vacation hearing. He argues that the Minister did not challenge the authenticity of the sports and education documents at the vacation hearing and cannot now complain that the Board used those documents in a manner consistent with the decision in Coomaraswamy. Maheswaran, supra, held that, in deciding whether, apart from the misrepresented evidence, there was other sufficient evidence to uphold its earlier decision that a claimant was a refugee, the Board must confine itself to the evidence that was before it at the determination hearing. The Board must not reassess evidence that was not tainted by the misrepresentations in light of the evidence adduced by the Minister at the vacation hearing as proof of the claimant’s misrepresentations at the determination hearing. In para. 33 of Aleman v. Canada (Minister of Citizenship & Immigration), 2002 FCT 710, Justice Rouleau, relying on Coomaraswamy quoted above, clearly said that in a vacation hearing the Board cannot impute negative credibility to documents when the documents themselves do not constitute misrepresentations. The Board correctly recognized the distinction between subsections 109(1) and 109(2). It considered whether the evidence relative to the misrepresentations of the other identity documents undermined the authenticity of the sports and education certificates. The Applicant Minister concedes that the remaining certificates are not misrepresentations. Having concluded that the evidence in those certificates did not arise from misrepresentations, the Board recognized that it was not to reassess the credibility of that documentary evidence. It follows that the Board did not err by declining to reweigh the sufficiency of the sports and education documents in light of the evidence that showed other misrepresentations, as argued by the Applicant. The final issue is whether the Board’s overall decision with respect to subsection 109(2) meets the standard of reasonableness. The Applicant argues that it does not meet that standard. Relying on the facts that the Respondent had been sent a false passport, had used a false birth certificate and driver’s licence, that he had used a different name while in the United States and that he had lied, in his original PIF, about his travel route to Canada, the Applicant submits that the Board’s finding that the remaining documents constitute sufficient credible evidence of the Respondent’s identity is not within the range of reasonable findings. In reply, the Respondent argues that the Board found his explanations to be reasonable concerning the fraudulent passport and the inaccuracies in his original PIF. The Board thoroughly weighed the remaining evidence that had been submitted by the Respondent, at the original hearing, to establish his identity. He submits that on the basis of the evidence that the Board discussed, the decision fell within the range of “reasonable outcomes”, as discussed by the Supreme Court in Dunsmuir at para. 141. In my opinion, the matters raised by the Applicant relative to this final issue are irrelevant to an analysis pursuant to subsection 109(2). As discussed above, the Board was correct in declining to consider the misrepresentations when assessing the sufficiency of the education and sports documents to establish the Respondent’s identity. The conclusion that the education and sports documents were sufficient to establish the Respondent’s identity was reasonably open to the Board. The application for judicial review is dismissed. In assessing whether it is “satisfied that other sufficient evidence was considered at the time of the first determination to justify refugee protection” under s. 109(2) of the IRPA, is the Refugee Protection Division precluded from reweighing the “other” evidence in light of the evidence of the misrepresentation adduced by the Minister at the vacation hearing which taints it? I am not satisfied that this question meets the criteria to be certified, namely that it is a serious question of general importance that would be dispositive of an appeal; see Zazai v. Canada (Minister of Citizenship & Immigration) (2004), 318 N.R. 365. In my opinion, the Applicant’s proposed question was answered by the Federal Court of Appeal in Coomaraswamy. As a result, the proposed question does not meet the criteria for certification as it is not a serious one of general importance. THIS COURT ORDERS that the application for judicial review is dismissed, no question for certification arising.